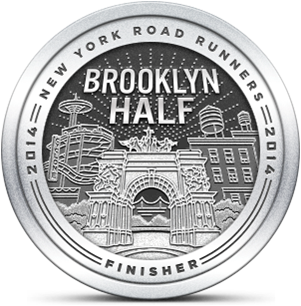 Could it be possible that the Runsketeers had not got together for a full group run since February? A look through the Emerging Runner archive confirms it. Unbelievable. Criminal really. 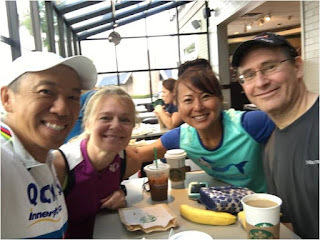 Well, no matter, we reunited this morning at Runsketeer headquarters adjacent to the Bethpage bike trail and had a short, pleasant run and a long pleasant coffee-breakfast at Starbucks. The plan was to meet in our usual spot at 8:00 AM. Although we have met there many times before, it's always necessary that I send out an actual address to my run mates to GPS, lest they end up going to Bethpage State Park instead. That worked, and when I pulled up at 8:00, KWL, SIOR and TPP were sitting curbside talking about some unmentionable affliction being suffered by TPPs paramour. I now understand KWL's expression when I arrived. It was a silent thank you for interrupting that conversation. The four of us chatted for a surprisingly long time before we started to run. Usually SIOR demands that we get started when I'm about halfway out of my car. SIOR and TPP took the lead while KWL and I followed. Unfortunately, my Garmin had gone from ready mode back to nothing mode. When I reignited the GPS, it wouldn't find a signal or let me start the timer. By the time KWL and I got going, our runmates were a quarter mile up the trail. SIOR has been unable to run for a number of weeks because she has tendinitis and a slight tear in her meniscus. She became a vegan and everything is fine now. Actually, it's been a tough recovery for her but she's back running easy 8:30 miles. Or as I call them, going full bore during a 5K. KWL and I ate up the trail, moving along at my meager pace. The good news was that I could run and talk with no problems, something I have not been able to do for some time. At the 1.5 mile mark we caught up with SIOR and TPP who had stopped because that was the turnaround point. Soon after, we were passed from the north by a couple of runners, one that SIOR knew. He was a run leader for Life Time Fitness, which SIOR does as well. We chatted with them for a few minutes covering important topics like dead mice on the bike trail and why I can't run in the Diva half marathon unless I pretend TPP or SIOR are my daughters. The 1.5 miles back seemed to take no time at all. Soon enough, we were back again at Starbucks for post run refueling. I got a Grande coffee and an egg and cheese muffin because I don't eat sugar very much anymore. KWL got a much meatier version of that, because he's running 18 miles tomorrow and had ridden his bike 25 miles to meet us this morning. Oh, and he's running a half Ironman in Atlantic City in two weeks and then running the Berlin marathon a couple more weeks after that. SIOR had two bananas and TPP had pumpkin bread which I would have shared with her while she wasn't looking, but held back due to its sugar content. We covered a lot of subjects, most having to do with nutrition, tech gear or politics. We are pretty much aligned politically which made that okay. The one area where we violently disagree is the consumption of crickets (and silkworms) as a protein source. Well I violently disagreed. KWL was fine with both, SIOR eats silkworms (sort of and also, gross). I don't think she was in the pro cricket camp, but I think it's because she's a vegan now. TPP was pro cricket, but I don't know her position on silkworms. The great thing about the Runsketeers is that we can go seven months and start exactly where we left off the last time we got together. But it's better when we don't go seven months between our runs. We agreed that we'd do this all again next month after KWL gets through his international running tour. I really loved today's run with my buddies and was very happy with my workout. I could have easily gone six miles or more today. SIOR's knee held up great and it looks like she's back to normal. Well, at least her knee is.